You may know David Carl from his portrayal of Gary Busey in his standout one-man comedy show, David Carl’s Celebrity One-Man Hamlet. 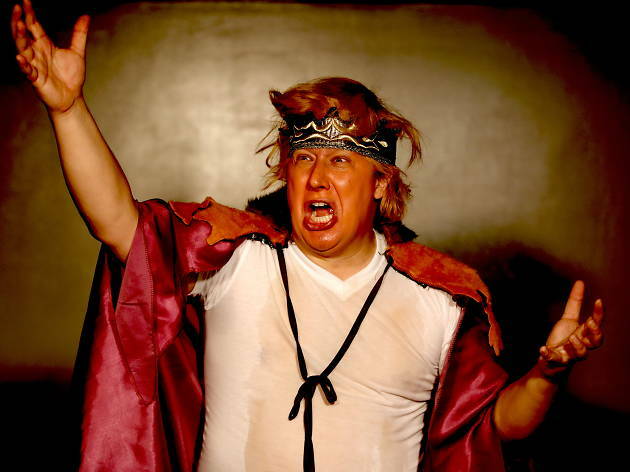 Now Carl plays an actor named Carl David (try to keep up), who evokes the wrath of Donald Trump by portraying the President in a solo version of King Lear, Shakespeare's portrait of a senescent ruler whose vanity tears his country apart. He's taken the show on a world tour and brought it back to NYC, all while the president continues to feed him material. Count on new levels of thrilling madness from this virtuoso. Do you like Shakespeare? Puppetry? McDonald's? Can't stop reading the news? Take a little break, check out this show and enjoy all of this at one time. This is an excellent ride! David Carl proves not only a talented comedian. In Trump Lear, he finds a way to incorporate his unbelievable range of impressions, his wit, and his comedic timing, with a surprising take on the one-man-Lear. Without giving anything away, Carl showcases his storytelling chops and draws the audience into a frightening and intimate world that is not too hard to imagine, all while displaying a strong handling of Shakespeare. 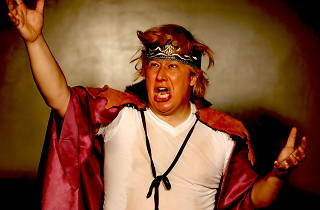 Tiny spoiler: he does it all without too much shakespeare, for the uninitiated purely seeking a comedy show. Nonetheless a one joke jab at Trump this play is not. Check it out! Totally worth it. My fiance and I saw it and we were talking about it for days! This show is not only comically satisfying-it's cathartic! David Carl bravely straddles two extreme theatrical territories: INSIDE Donald Trump's mind and ON STAGE as his prisoner/performer. Carl masterfully navigates between his identity as a satirist (or should I say activist?) and the Shakespearean characters and scenes he's teased out of King Lear (deftly re-cast with Trump family and administration). To say it's entertaining is an understatement! Carl's long proven he's a consummate impressionist, improviser and solo performer, and here he has the chance to fire on all cylinders. Not to mention plead for his life and argue with the voice of a disembodied 'Trump'-both things some of us find ourselves fantasizing about while making coffee or riding the subway these days. To say it's 'absurd' is fair, but only insomuch as its a boldly imagined situation-but one we artists fear under this administration. Will we be censored? Will we have to plead for our grants and livelihoods?? Will we look back on the days when we used to have term limits and new presidents??? If we can't laugh, what can we do? We can go see 'Trump Lear' starring David Carl and directed by Michole Biancosino! It helps.